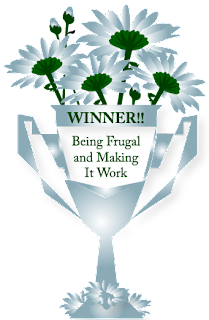 Being Frugal and Making It Work: Chicken Soup for the Soul: Mothers & Daughters Winners Announced! Chicken Soup for the Soul: Mothers & Daughters Winners Announced! 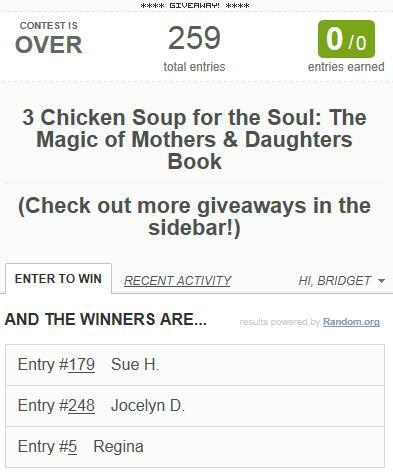 I want to thank everyone who entered my Chicken Soup for the Soul - The Magic of Mother's & Daughters Giveaway. 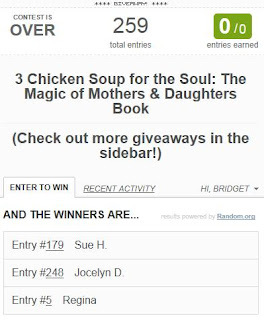 I would also like to thank Chicken Soup for the Soul for making this great giveaway possible for my readers. CONGRATULATIONS, Sue, Jocelyn & Regina!